A previously unpublished John Constable sketch drew prolonged bidding at south London saleroom Roseberys. 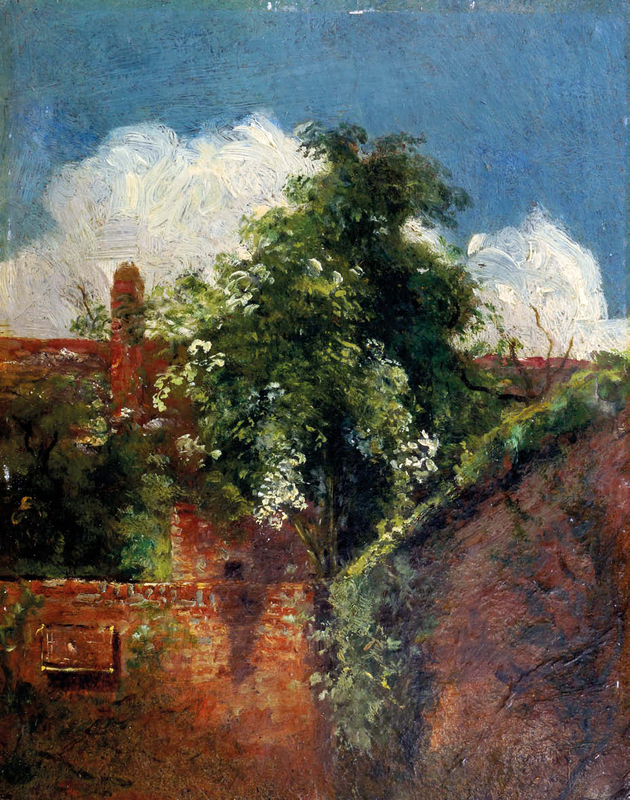 'View towards the back of a terrace of houses with elder tree' by John Constable which sold for £305,000 at Roseberys. Bidding for the oil on board, which had the descriptive title View towards the back of a terrace of houses with elder tree, rose in £5000 increments from the low estimate of £20,000 in the March 21 auction. It was eventually knocked down by auctioneer Bill Forrest to a room bidder at £305,000 (plus 23% buyer’s premium), who saw off strong interest from two separate parties on the phone. This spectacular price – the second highest for the West Norwood firm next to a £440,000 Leon Bakst oil sold in 2013 – was the culmination of four months of research. The picture had come by descent from the family of the former US ambassador to the UK, John Hay Whitney (1904-82). Anne Lyles, former curator of 18th and 19th century British art at Tate Britain, and Constable expert, confirmed the attribution and provided the cataloguing. Constable first took lodgings in Hampstead in the summer of 1819, then a village about five miles north of London, for the benefit of his wife’s health and that of his young family. For two consecutive summers in 1821-22 he rented a house at 2 Lower Terrace, close to the edge of the heath. In keeping with related Hampstead sketches from this period, including two once owned by Isabel Constable who was born at the house in 1822, this 7 x 6in (18 x 14cm) study is painted on millboard. While the exact location of this view could not be identified, the depiction of an elder tree was not unusual. It was one of Constable’s favourite trees and, according to Lyles, “he regarded it as possessing overtones of melancholy”. Marcus Grey, head of Roseberys’ picture department, said: “This is an exquisite example of Constable’s work that reveals an intimate view into his life at that time.